Newly Independent Chrysalis Records continues to repackage and refurbish the classic albums of Ten Years After as part of a campaign to reintroduce all their classic albums and releases throughout the next two years. After the release of the Ten Years After 10 CD Box Set, and the release of the studio albums on CD, Chrysalis presents the release the vinyl edition of the band's best-selling album on vinyl for the first time in more than 10 years. 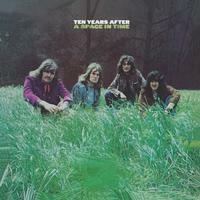 Ten Years After were an English blues rock band who, between 1968 and 1973, had eight albums in the U.K. Top 40 albums chart and 12 albums in the U.S. Billboard 200. Vocalist, guitarist and principle songwriter Alvin Lee formed The Jaybirds with bassist Leo Lyons in England in the early 1960s. Joined by Chick Churchill on keyboards and Ric Lee on bass, they switched their name to Ten Years After in 1966; a reference to the birth of rock 'n' roll with Elvis Presley a decade earlier.